Accenture (NYSE:ACN) has launched the Accenture Federal Services (AFS) Cyber Center, a state-of-the-art facility in San Antonio that provides cybersecurity capabilities on an as-a-service basis to help government agencies and the Department of Defense manage, detect and respond to the increasing volume and velocity of cyber threats that target government networks. 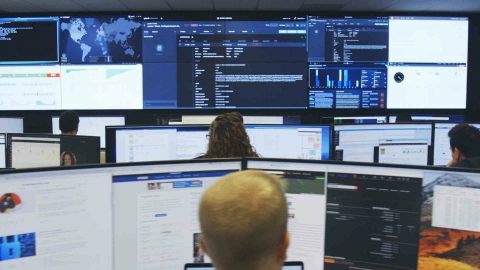 The Cyber Center offers a comprehensive suite of security-as-a-service solutions and leading-edge capabilities in advanced adversary simulation, orchestration & automation, and managed detection and response. An interdisciplinary team of advanced cyber defense experts deploys advanced technologies — including artificial-intelligence-based cyber intelligence — to help government agencies quickly and cost-effectively identify, emulate and eliminate threats. "Government agencies need cybersecurity solutions that can keep pace with the increasing complexity, volume and speed of today's threat landscape," said John Goodman, chief executive of Accenture Federal Services. "Our advanced cyber capabilities and experienced cybersecurity specialists are delivering the threat intelligence and elimination services that our clients need to ensure mission success and resilience today and in the future." The Cyber Center is part of a larger AFS expansion in San Antonio. The company currently employs more than 1,300 people at its two primary San Antonio locations and recently announced plans to invest $5 million and add 500 full-time jobs over the next four years to enhance and expand the operations of its Advanced Technology Center in the city. "We're proud to partner with Accenture Federal Services in building the next generation of tech talent to serve and protect the nation, right here in the heart of San Antonio," said Ron Nirenberg, Mayor of the City of San Antonio. "The new Accenture Federal Services Cyber Center, at the leading edge of innovation, will help us to grow and build our cyber workforce, and further strengthen our standing as a premiere technology and cybersecurity hub in the U.S."
Accenture is also extending its commitment to provide student internships and apprenticeships that advance industry-relevant skills and provide on-the-job training opportunities to help train the next generation of U.S. technology talent. AFS recently became the anchor industry partner for San Antonio Cyber P-TECH, which gives students the skills, credentials and industry-specific associate degrees necessary for high-wage, high-demand careers in cybersecurity. "San Antonio is rapidly becoming one of the most important technology hubs in the United States," said Ben Peavy, Accenture's office managing director in San Antonio. "By investing in internships, apprenticeships and other professional-development opportunities for local students and workers, and by creating well-paying jobs in the community, Accenture Federal Services is helping build a next-generation federal technology workforce here in the heart of San Antonio." Accenture is a leading global professional services company, providing a broad range of services and solutions in strategy, consulting, digital, technology and operations. Combining unmatched experience and specialized skills across more than 40 industries and all business functions — underpinned by the world's largest delivery network — Accenture works at the intersection of business and technology to help clients improve their performance and create sustainable value for their stakeholders. With 477,000 people serving clients in more than 120 countries, Accenture drives innovation to improve the way the world works and lives. Visit us at www.accenture.com. Accenture Federal Services, a wholly owned subsidiary of Accenture LLP, is a U.S. company with offices in Arlington, Virginia. Accenture's federal business has served every cabinet-level department and 30 of the largest federal organizations. Accenture Federal Services transforms bold ideas into breakthrough outcomes for clients at defense, intelligence, public safety, civilian and military health organizations. Learn more at www.accenturefederal.com.